The Daylily is native to Eurasia, including China, Korea and Japan. The name 'daylily' derives from the flowers which only last for one day. They open in early morning, wither during the following night - and are replaced by a new flower on the same flower stalk the next day. Daylilies grow as a clump and have thickened roots in which they store food and water over winter. It has long, arching, grassy leaves that are grouped into opposite fans. The 'Hush Little Baby' Daylily will grow into a low mound of 47cm high. Daylilies need full sun to partial shade and are not particular as to soil type or pH. They can be propagated by sowing seeds in summer or by planting the small leafy "proliferations" that form at nodes or in bracts along the flower stalks - they will root. Daylilies die down in winter and the dead leaves should be left on the ground to ensure effective cover for the root clump. In late autumn or winter, overgrown clumps can also be dug up and carefully divided. Early spring they need to be tidied and cleaned up before they start to grow for the new season. 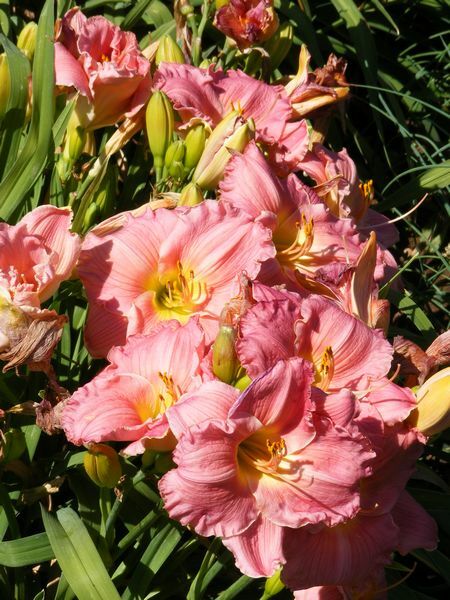 Daylilies will attract butterflies and bees to the garden. They are low maintenance perennials that can be planted as weed-excluding ground covers. 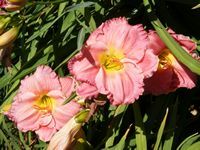 Daylilies will survive harsh conditions that other plants cannot, like under and around trees, polluted city environments, slopes and poor or dry soils. The daylily plant is edible and is considered as a delicacy by wild food gardeners and knowledgeable chefs. The flowers (with the pistil and stamens removed), can be eaten at any stage - from the green bud up to when they begin to wither. The petals of fully open flowers are thick, crisp and juicy with a delicate sweetness at their base due to the nectar they contain. Daylily flowers taste like butter lettuce. It can be eaten raw, added to salads or used to garnish plates and platters. Flowers can be dipped in batter and fried, stuffed with a filling or it can be used as a container for spreads or sour cream. Cooked flower buds taste like green beans. In Asian cooking newly wilted flowers are dried and used as a vegetable and thickening agent - remember to check for bees that might be trapped inside. Buds that are just about to open can be sautéed in a mixture of olive oil and butter, and then seasoned with salt and pepper. Very young shoots can be harvested in early spring - they taste like creamed onions when simmered in butter. They are also excellent raw, in salads, with a dip, or in a stir-fry. The thick, fleshy, sausage-shaped roots (harvested in winter), are crisp and have a nutty flavor. They can be eaten raw, added to salads, soups and stews, be cooked, stir-fried or creamed and served as a side dish in place of potatoes. The young shoots, flower buds, flowers and roots. Daylily flower buds are good sources of beta carotene and vitamin C.
The juice of the roots is an effective antidote in cases of arsenic poisoning and the roots also have a folk history of use in the treatment of cancer. In China, the roots are used as a mild diuretic and laxative. Some people might have allergic reactions to unusual compounds in plants. If you are trying them for the first time, start with a nibble and wait an hour before trying more. If it tastes bitter, too spicy, weird or unpalatable, don't swallow it and spit out. Personally, I found that, if eating the raw petals of more than two daylily flowers, it gets too spicy - only consume small amounts. Never eat landscape plants that might be sprayed with pesticides or plants growing near a busy roadway. Do not confuse daylilies with true lilies which are not edible. Daylilies are good cut flowers because new flowers will continue to open on cut stems over several days.